Spark your little one's creativity with this huge pack of PLAY-DOH modeling compound!With the 16 bright colors in this set, your little artists will amaze you with their imaginative creations. Get a rainbow of color with the BOX O' COLOR set! 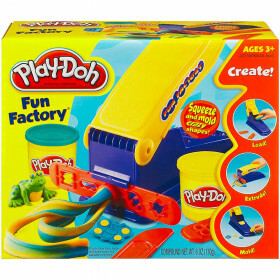 Little hands will love to create when they get hold of this big pack of PLAY-DOH modeling compound!There are 6 colors in the pack, and your little ones will love making bugs, race cars, or anything else their creative impulses can come up with. Grab the PLAY-DOH COLOR STICKS and start their imaginations!Assortment of 2 includes Classic and Bright colors.